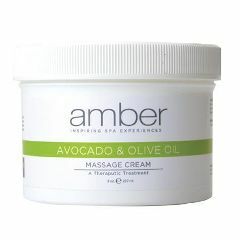 This Nut Free formula combines Avocado and Olive Oil with the creamy base of Soybean Oil, Aloe Vera and Vitamin E to provide a deeply penetrating and hydrating massage. Olive Oil, rich in Vitamin E, creates a barrier locking in the moisture for increased hydration and more supple skin. Avocado Oil is rich in Vitamins A, B1, B2, B5, D and E along with Lecithin and important Fatty Acids that together increase the production of collagen and increase skin elasticity. Penetrating formula helps tighten pores and rehydrates skin cells. This cream has a 2 year shelf life.